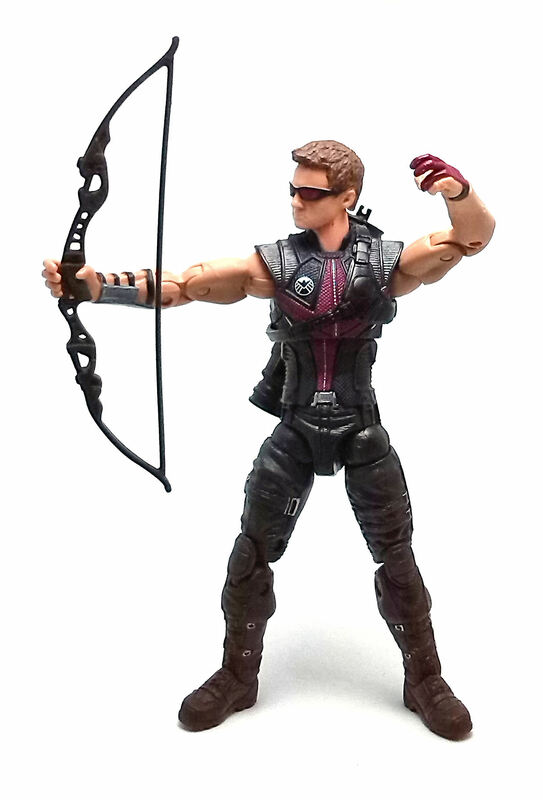 Today I’ll be taking a look to the Hawkeye action figure released by Hasbro as part of the Avengers Movie Series exclusive to WalMart in both the USA and México. Well, after reviewing a handful of versions of this character, wearing the same costume in the 3.75 inch lines, there is not much to add as far as describing his outfit, although the implementation on the larger-scale figure really shows off the advantages of working in the 6-inch scale. This time around Hawkeye’s costume holds much more sculpted detail than the small scale figures had. 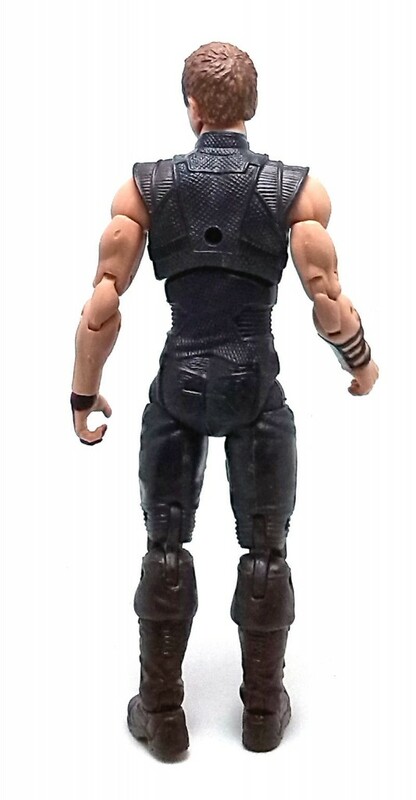 The uniform has nicely textured sections and the musculature on the arms is much more defined. 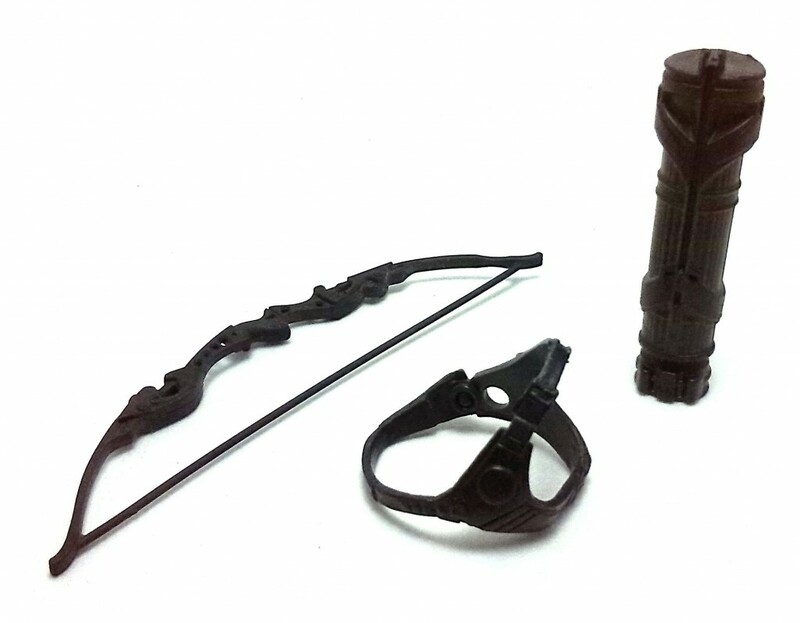 Instead of having the quiver and webgear sculpted onto the body, these pieces are now separate accessories. 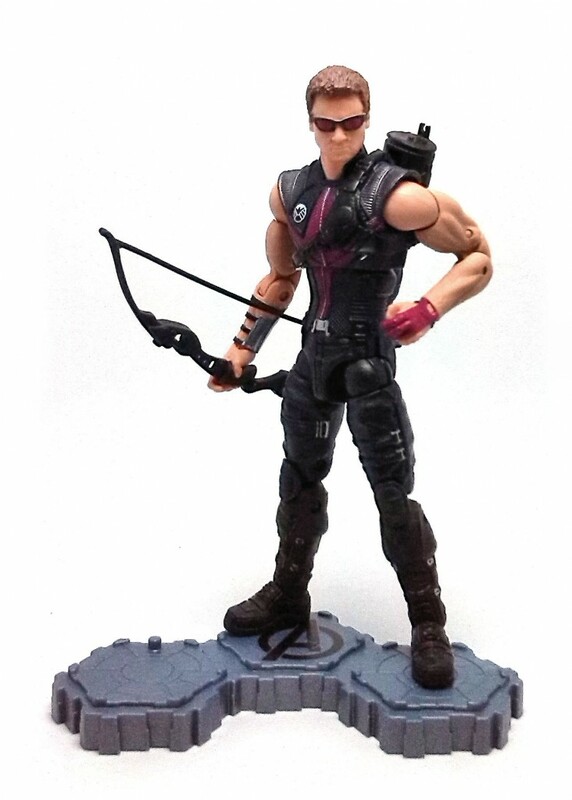 The head sculpture has a better size too, and has displays a really good likeness to actor Jeremy Renner. I still wonder how far in advance to filming the movie were these figures designed, since the character never really wore these sunglasses onscreen. 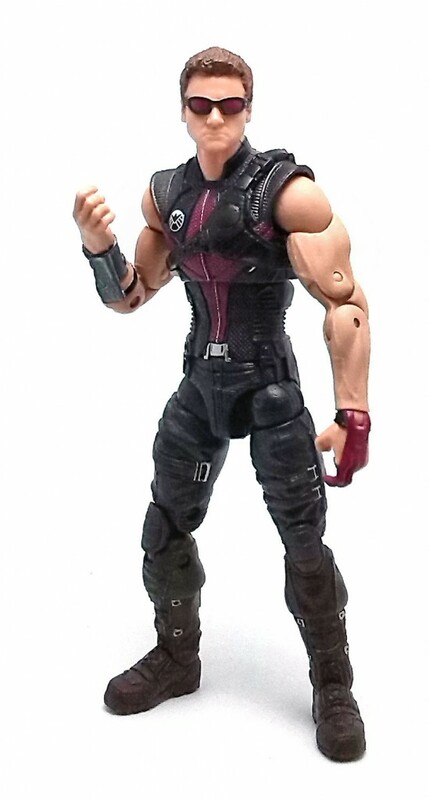 I guess they would be offering an alternate head sculpt by the time Avengers 2 rolls around. Even though this articulation scheme is still not quite as extensive as the one ToyBiz used back in the day, I like that Hasbro has been applying it consistently to their Marvel figures, which in turn lends a nice uniformity to a collection. 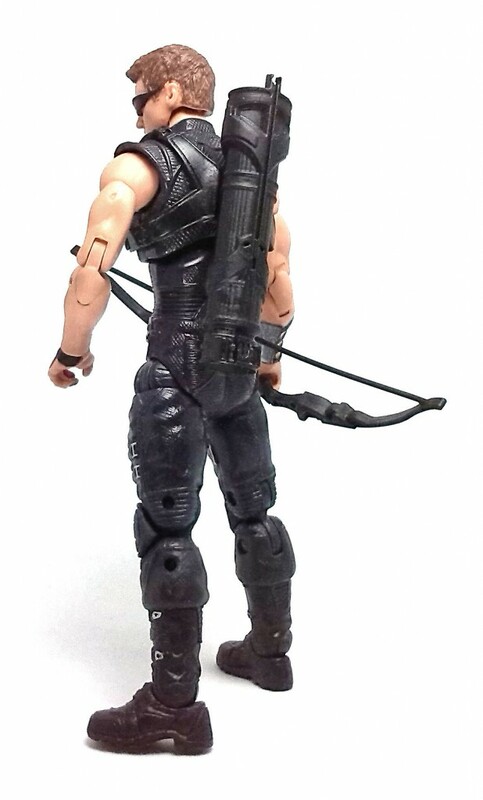 The paint job on Hawkeye is very sparse, as most of the figure was molded in the final colors of plastic. There are accents painted in silver and purple on the uniform, as well as on some of the accessories sculpted onto the arms and head. The overall application is very neat and clean, with the silver SHIELD crest stenciled over his chest being a particularly nice touch. As I mentioned, the quiver and harness are separate accessories. The harness is easily removed and has a hole that coincides with the hole at the figure’s back, which in turn holds the quiver piece; also included is a composite bow sculpted with a string. There are absolutely no paint applications on these accessories. The one other item included is the gray plastic base shaped like interlocking hexagonal plates. This base has three pegs sculpted on top and the Avengers symbol painted onto the central section. 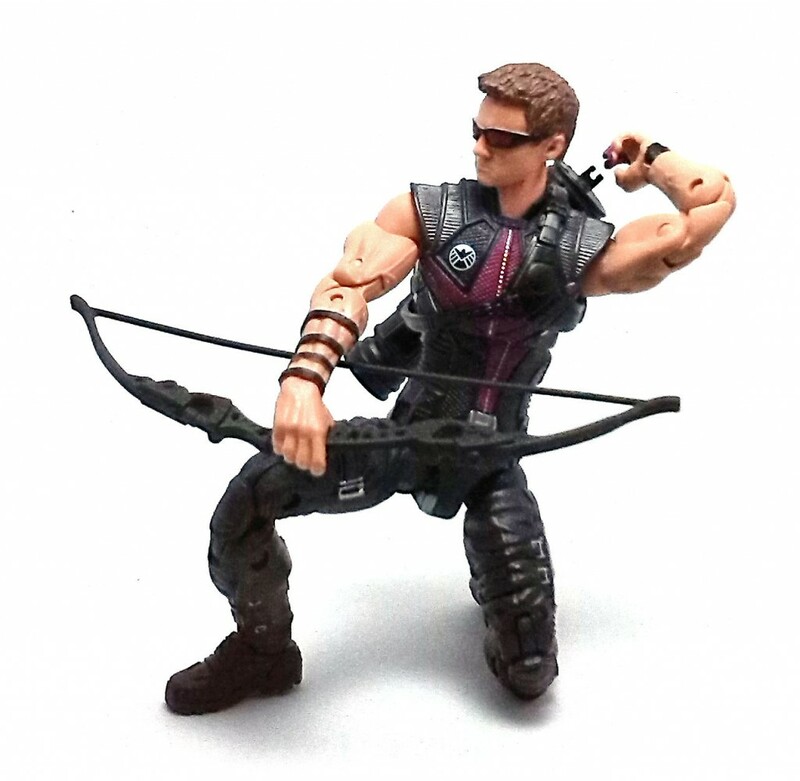 Out of the six figures available in this Avengers Movie Series, Hawkeye easily ranks into my top three (alongside Hulk and Loki). He may not be the most powerful or flashy character in the team, but this action figure turned out really great.